When it comes to comfort and touch on the ball, the Tiempo Legend series has always been a true leader. In keeping with that tradition, Nike has unleashed the seventh generation by combining heritage styling with advanced tech specs. This could be the most advanced Legend to date, with an emphasis on durability and the overall structure of the boot. For example, Fit-Mesh is introduced for the first time and woven across the upper to act like a Chinese finger trap. The more pressure you apply, the tighter it holds. Given the extensive push Nike has made on the market through their release, we made sure to push them through their paces to find out what exactly they have on offer. And to see if durability has been improved! Note here, we used the Special Edition Blackout version for testing, but this review features the recently released Pitch Dark version. 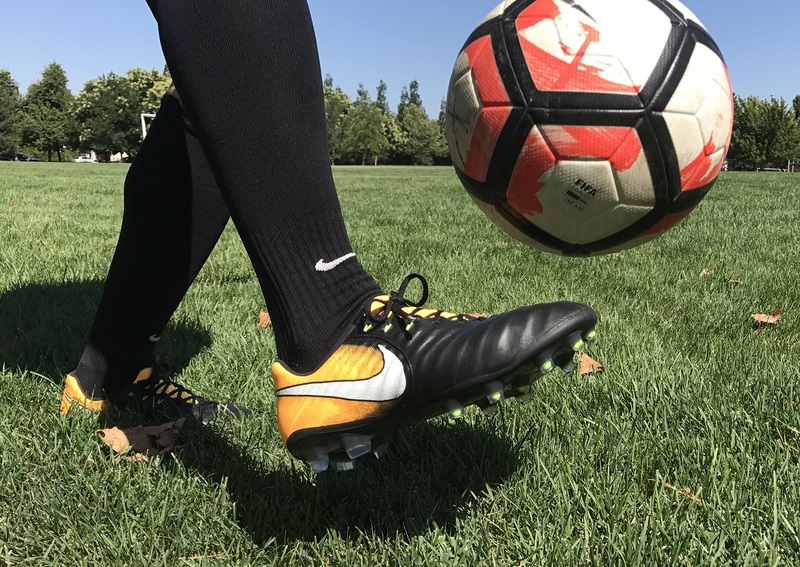 You can find all available Tiempo VII colorways at soccer.com. Because of the nature of the boots design – more on that below – they are intended to fit very tight from first wear. I took them right out of the box and into a game with no problems. 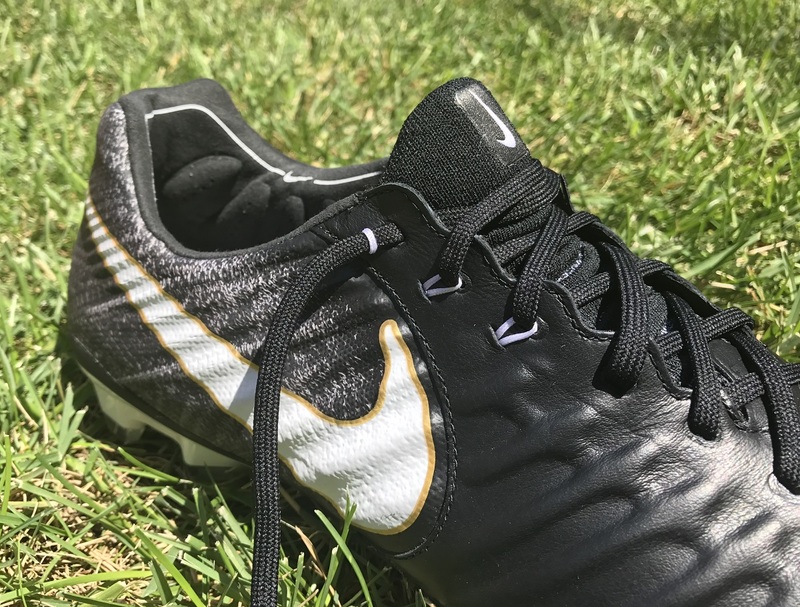 The upper is supple enough to move in unison with your foot and adjust as you make your debut with them, while underfoot the soleplate has a lot of natural flex, specifically right under the big toe ball joint. If you get the fit right and they are not too snug, I don’t see anyone having an issue through the break in period. Who doesn’t love a boot that features black, white and a touch of midas gold detailing? 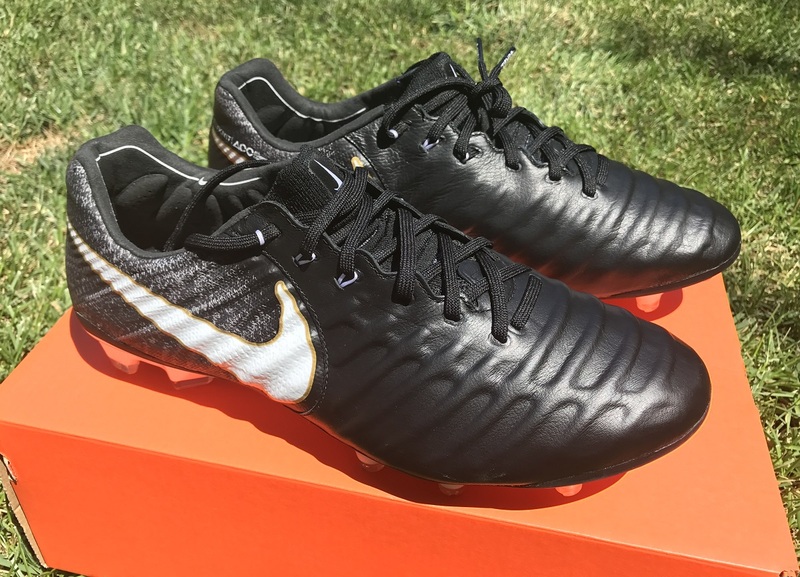 Nike has created a very elegant design on the Pitch Dark Tiempo, keeping it ever so classy with the black k-leather upper, but decking the design out with some clever touches. Like for example around the heel, where a mix of heather grey and black mimic the appearance of knit. It is a subtle move that adds extra dimension to the design. And the use of gold to outline the signature Nike swoosh takes things up a notch! 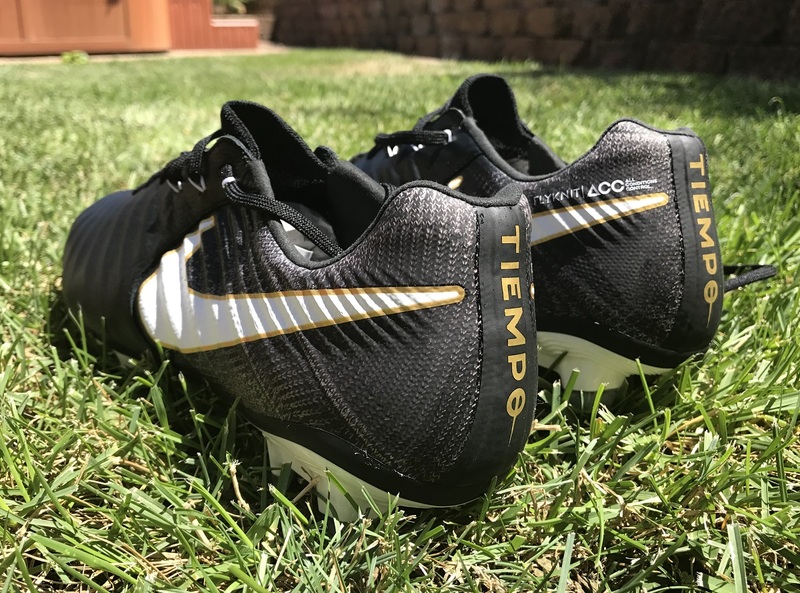 One of the first things you will notice about the Tiempo VII is the highly defined upper and the fact there is not a single stitch used through the strike zone. This all plays out to improve the overall fit and feel, with Nike leveraging a sort of 4 tier system. Nike uses a soft, seamless k-leather throughout the forefoot. This is the top layer and the first level between boot and ball. The leather is fused with a thin foam, this adds a little extra cushion and strength to the upper material. 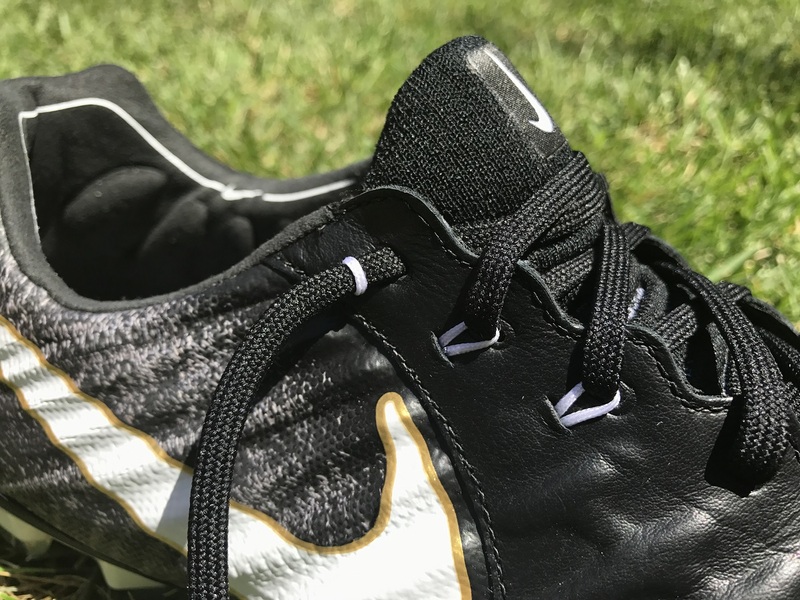 Fit-Mesh, which makes its debut inside the Tiempo Legend 7, acts as a floating lining attached to the raised biteline of the boot, not the leather. It helps contain your foot so the leather doesn’t have to. Nike Flyknit through the midfoot and tongue encases Flywire and helps provide cushioned coverage atop the foot. Ok, so with all the tech specs out of the way – as per above – how do they actually perform? Well, I’m a big fan of what they have to offer overall. First, the k-leather upper feels great. With the Fit-Mesh in play underneath, it doesn’t have that buttery soft feel like you’d expect a k-leather to offer, but it is still soft enough to provide soft touch in play. 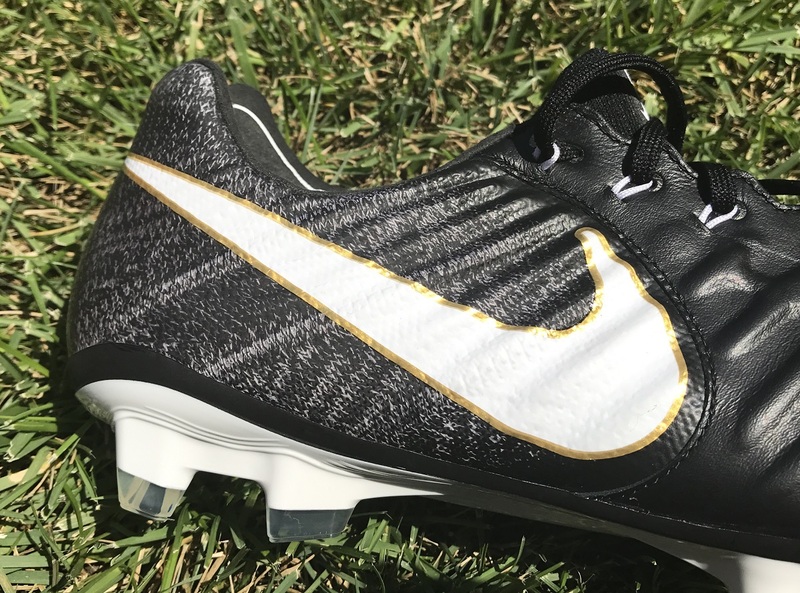 One of the things Nike looked to do with this released was enhance the durability of the material, and the current design seems to have addressed any concerns. What you now get is a mix of clean touch and extra definition for enhanced feel on the ball. 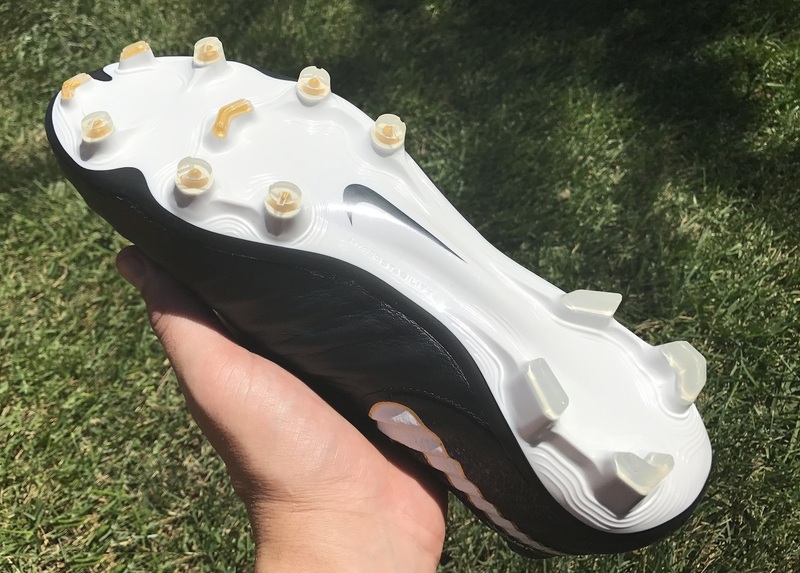 They have an almost CTR360 feel about them, where the extra padding along the upper provides an extra dynamic as you come into contact with the ball. That could be first touch, where there is a dampening effect, or when looking to move across the pitch with the ball close to your feet. When it comes to striking the shots, the extra dampening also has a beneficial effect, even if it is minimal. I actually found that you were able to control shots and add a little extra spin where needed. 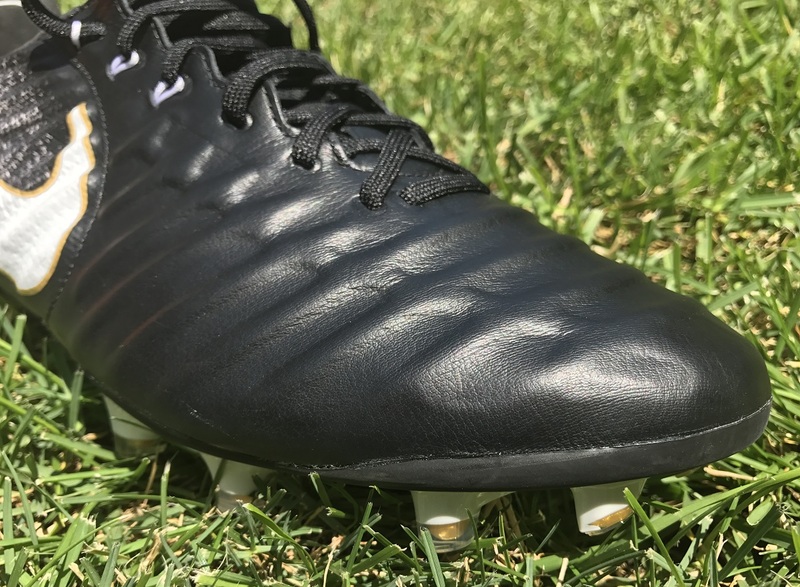 The extra definition allows the boot to wrap around the ball and connect with extra grip. Underfoot, they are 22% lighter than its predecessor, all related to the new Hyperstability soleplate. The plate features a mixture of jagged conical studs, chevrons, and blades. As with all Nike boots, the precise traction pattern was refined through Finite Element Analysis (FEA). We are at the stage where brands will use the same tech talk when it comes to traction across all their boots, no matter the configuration they put into play. Basically, all you need to know is that they felt equally good on FG and Turf surfaces. The system can be used on both, and I personally enjoyed the traction I experienced while wearing them. In general, a conical shaped stud is going to give you the more balanced type of traction without trapping or dragging in the surface. So, how do they actually feel on foot? This is definitely a snug fitting boot, with all of the materials locking in to create an “as one” connection with your foot. From the design of the tongue, to the ability to tighten the Flywire lacing, they are extremely adaptive through wear. You can definitely dictate how tight they fit around your foot, but unfortunately you can’t really go the other way like you would in boots with a detached tongue. From the first time you try to put them on – use the stretch in the tongue to help open the ankle slot – they should be pretty tight, they are designed to be. I found that they fit my medium/wide foot very well, with enough flex through the upper to keep things comfortable. In terms of length, they are very much true to size. If you wore the Tiempo Legend 6 and are wondering how they compare fit wise, everything about them is very similar. Whatever size you were comfortable wearing in the Legend 6, you will also wear in the Legend 7. For Tiempo fans, the key talking point on this one will be durability, and how they hold up over time. This was an area where the previous version of the boot fell short, something Nike were well aware of. Immediately, there is a more dependable feel about the design, with the upper having a more rugged construction. Plus the lip around the tip of the boot sits slightly higher and tighter against the k-leather upper. Through testing, we have had no issues and we are actually continuing to wear them just to see how long they last. If we have any further updates we will add them here, and I’m sure we will receive some reader feedback in the near future! As is the case with all boots in the Tiempo Legend series, these are created with comfort and touch in mind. So, we are talking about players that like to get on the ball, take the ball into space and lay off clean passes. Think of players that like to stamp their authority on the game without being overly flashy. They have quickly become a favorite of defenders; Sergio Ramos, Gerard Piqué, Eric Bailly and Thiago Silva all currently wear them. But they also have a huge presence among midfielders that want to impress in a very simple fashion. As far as boots go, this is one of the more uncomplicated on the market. 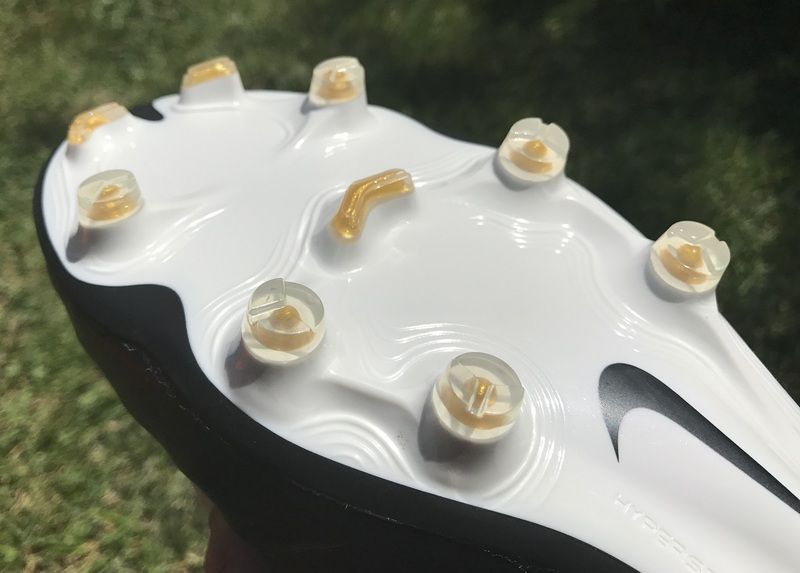 Nike has upped the tech specs, but they still provide a very natural level of performance and that gives them their own unique position. I pretty much enjoyed everything about them, so there isn’t too much to discuss in the way of problematic areas. If you decide to get a pair, just enjoy them! 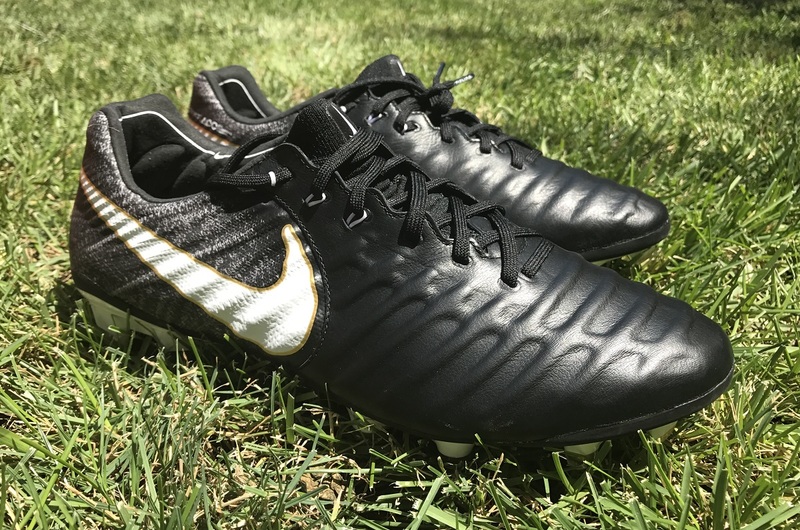 Something unique that Nike has done with the Tiempo 7 series is release it in traditional black colorways. When was the last time we saw a new release hit the market with back-to-back black upper designs? It is a really smart move, as it gives the boot a true heritage feel, but it is one that won’t last. So, traditionalists enjoy this moment of heritage glory. Retail wise, they drop in at $229, and you can find the entire line-up currently available at soccer.com. Highlight: Comfort, clean touch and a heritage design all coupled together with advanced pieces of tech. A supple K-leather top level, a textured foam skeleton underlay, a Nylon backer for support, and a Fit-Mesh lining to reduce stretch. 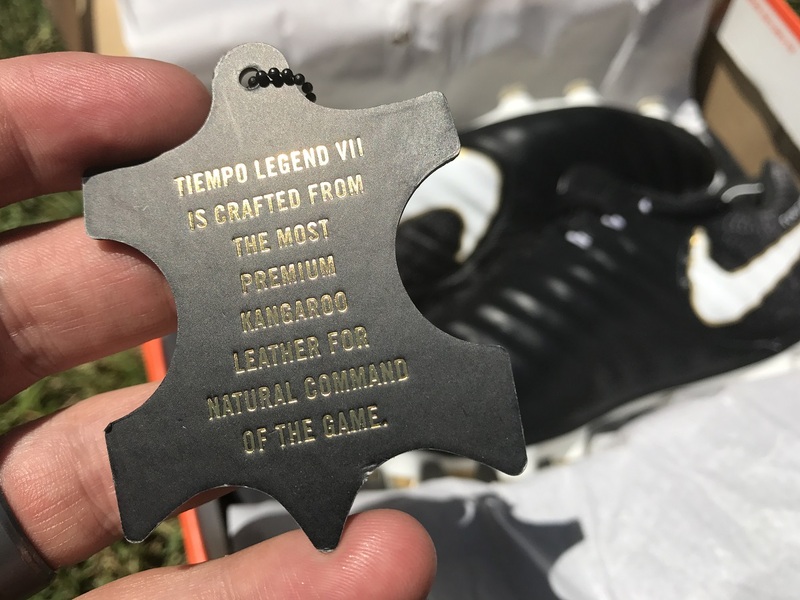 Would I Buy Them: This is a top quality release that continues to cement the name of the Tiempo Legend series. I’d absolutely buy a pair, one of the best boots on the market right now. Player Position: They have quickly become a fan favorite for defenders and midfielders that like to dictate the game. Very good review Bryan. Looking forward for comments regarding durability issues. Keep the good work. I'm so undecided on buying a pair. I was disappointed in my Legend 6"s. Not necessarily with durability, but with comfort and blisters….I may just snag a pair of Legend 5"s on eBay. Do you feel any difference between the two football boots because I want to buy one of these but don't know which one to go with. I’ve had mine of about a month, and there’s a slight and small separation at the toe. Have you experienced this? Not sure if it’s something just common with Nike boots. Would appreciate your feedback. I was wondering what your experience was with the stretch of this boot particularly in the toe box and how much the length stretched. I bought two sizes (11 & 11.5) and am trying to determine which to keep. As far as length the 11 are super tight but bearable if the shoe will stretch like a Copa. 11.5 right now are more comfortable but I’m afraid the length will stretch too much and I’ll have a boot that’s too big. Thanks for the help. Hi Erik, I also just bought a size 11.5 because the 11 immediately felt a bit too tight and my toes were basically touching the edge. Which size did you decide to keep in the end, and how is it holding up? How is everyone else's legend 7 doing after a few months of use?